The Event Settings options allow you to configure the defaults to be used for your events. Setting up the defaults will save you time when creating events, and may be over-ridden as needed for individual events. Click Event Settings in the Event section. Invoice Line Item Description Option - Select what you like to be included in the invoice line items. Display Registration Descriptions by Default: Select this option if you wish to display the description of a registration fee on the event registration page, as shown below. If this option is not selected, the description will be displayed when a registrant clicks on the registration type. Confirmation HTML for Event Attendee Registration - Enter the confirmation that you would like displayed to registrants after they have completed their registration. This confirmation message is also included in the Registration Confirmation email. Confirmation HTML for Event Sponsor Registration - Enter the confirmation that you would like displayed to a sponsor after they have completed their registration. This confirmation message is also included in the Registration Confirmation email. Max Event Invited Attendees to Store: When the Event Invite email is sent out (from the event page), individuals will appear on the Attendees tab with the status of Invited. The number of individuals that will appear on the Attendees tab, will be based on the Max Event Invited Attendees to Store value. To display your events (whether publicly, member only, or internally) you will need to setup your calendars. Click Calendars in the Event section. A list of calendars currently configured in your system will be displayed. Name - This is the name that will display if you choose to publicize this calendar. Is Public Viewable- Select this check-box if you wish this calendar to be publishable on your website and viewed by the public. Is Member Viewable - Select this option if you wish this calendar to be available in the Info Hub. Group - Optional, select a group to associate to this calendar. Is Active - Select this check-box to activate the calendar and make it usable at least by staff members. i.e., in order for events to be added to a calendar the calendar must be active, even if it is not published/viewable on your website or Info Hub. Click Done to save your new calendar. You may modify any of your existing calendars. Click the link for the calendar you wish to modify. Make your desired modifications and click Done. Prior to setting up your event, you will want to setup the appropriate fee items for the event. Refer to Setup Goods and Services for details. You may add a new event by clicking the Quick Actions button in the header bar, or by clicking the Add Event button on the Events page. Name - Enter a name for the event. This is the name that will display on your web-site. Contact - Enter the contact person for the event. Description - Provide a description of the event. This description will be displayed on your web-site. Location - Enter location information. This information will be displayed on your web-site. Publish Date - Enter the date that you wish to begin displaying this event on your web-site. Start At/End At - This is the start time and end time of the event. Time/Hours Details - This section allows you to enter descriptive information about the time/hours of the event (such as when registration opens, when dinner starts, when auction starts). Organization - The name of your chamber/association will be automatically populated. You may change this to associate this event to a different organization. Additional Contact Details - This text box allows you to enter further contact information, i.e. name, phone number, email, etc. Category - To assist you in filtering, sorting and/or report on this event, you may select a category from the drop-down list. This is optional. Click here for further information on setting up Categories. Calendar - Select the calendar(s) on which you want to display this event. The event may be displayed on multiple calendars. Published Status - Select the status of this event, only approved events will be displayed on the calendars you have selected. Enable Registration - Select this check-box to allow registration for this event. If this is not selected, a registration button will not be displayed on your web-site, however, your staff members would be able to register people from the back-office. Event has Sessions/Breakouts - If you are using the Expo module, enabling this option will allow you to add sessions to your event. Click here for further information on setting up sessions. Event has Exhibitors - If you are using the Expo module, enabling this option will allow you to manage your exhibitors. Click Here for further information. Copy From Existing Event - if you wish, you can copy the details from an existing event to this event. Click Here for further details on copying events. Click Save to save the new event. If you run the same events regularly, you can copy an existing event and save yourself some setup time. You can determine key setup items you would like to copy, such as Attendee Setup, Tasks, Files, etc. Click Events in the Navigation Panel. Open the event you wish to copy by clicking on its name. Click the Action ribbon on the right. Update the desired event fields. Be sure to review the new event's name, as the name of the copied event will be part of it. This is easily deleted.Click Here for further instruction on available fields. Select the specific event settings you wish to copy from the original event. If your association has an event which occurs on a regular basis, save time by setting it up as a recurring event. Create your event, as described in Add a New Event. On the event's Overview tab, click the in the Recurrence section. Enter a name for the series. Enter a description of the series. In the Series Start Date box, enter the date of the first event. In the Series End Date box, enter the date of the last event in the series. Select from the following Recurrence Pattern options: Daily, Weekly, Monthly, Annually. This allows you to specify how often the event occurs. A gray box will be displayed on the Overview tab indicating that this event is part of a series. If there are no registrations or sponsors attached to any future events within the series then you may edit the recurrence settings. When making a change, you are only able to extend the date out, not move it back - unless you change the frequency. If registrations or sponsors are attached to future events within the series, you will only be able to delete the series. If a staff member wants to change the frequency after a series has been running for a while, best practice would be to delete the current series, and create a new event series. When a staff member deletes a series, they will see a message stating which events have registrations/sponsors attached, meaning those events will be no longer be part of the series, yet they will still remain active. This will allow no disruptions to those that are registered, and staff can those events on a one-off basis, if needed. Information such as the location of a recurring event, descriptions, contact information, etc. may be updated for an entire event series. NOTE: If there are no registrations or sponsors attached to any future events within the series then you may edit the recurrence settings. When making a change, you are only able to extend the date out, not move it back - unless you change the frequency. On the Overview tab for any of the events in the series, click the click here link in the grey box. The Edit Event Series dialog box will be displayed, shown partially below. Update information as needed. NOTE: If there are no registrations or sponsors attached to any future events within the series then you may edit the recurrence settings. When making a change, you are only able to extend the date out, not move it back - unless you change the frequency. The following items, on the event's Overview tab may be updated for an individual event. NOTE: Once updates have been made on the Overview tab for the individual event, the event is no longer a part of the series. CAUTION: Changes made to the Attendee Setup tab, will effect ALL events. If Overview information changes are not needed from one event to another, but changes to the Attendee Setup are needed, you may wish to use the Copy Event function. If Overview changes are needed for a particular event, make the changes to the Overview tab as described below, then update the Attendee Setup. From the Events module, select the desired event in the series. Make the desired changes to the Overview information. Your changes will be saved, and the event is no longer associated to the series. You may view your events, by selecting Events in the Navigation Panel OR you may type the event name in the Search box in the header bar. 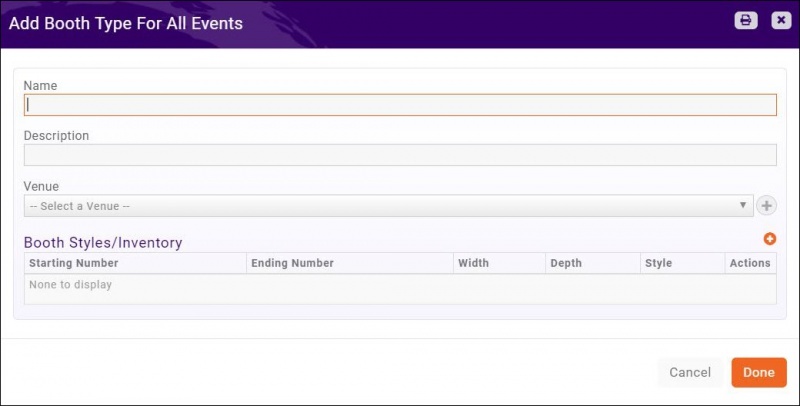 When you select events in the navigation panel all of your events will be displayed. You may view the events in list format or in card format by clicking the icons on the right-hand side of the screen. Click the name of Event you wish to edit to open the event's page. The Event page is setup with several different tabs that provide the functionality to customize and manage your event. 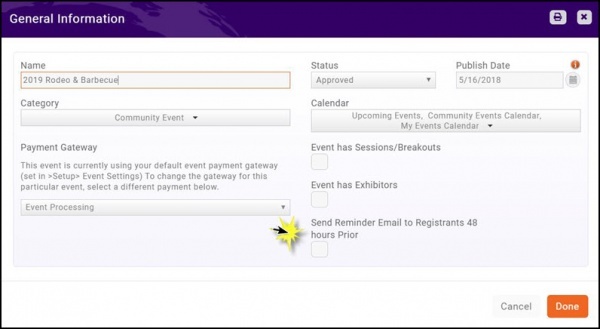 Events will use the default event payment gateway (set in Setup> Event Settings). You can change this in the General Information on the event's Overview tab. Select the event Overview tab. Click the icon next to General Information. Select the desired gateway from the Payment Gateway list. It can be challenging to remember and find the time to send an email to event attendees just prior the event's start date. To solve this, you can configure an automated reminder to be sent out 48 hours prior to the event. Click the Send Reminder Email to Registrants 48 hours Prior check-box. When this setting is enabled, the email message you selected for Event Reminder in Automated Messaging will be sent to all registrants. See Configure Automated Messaging for further information. In the Location section, add the actual address in the address fields. Both the address and the description will display on the event page; the completed address fields will also trigger a map to be displayed. On the Event page, click the image icon next to the event name. The Image Manager will be displayed. On the Image Manager screen, you may either drag & drop the image onto the screen OR click the upload button to browse to your image, and upload. Position selection rectangle around area you would like to use. You may drag an image into the image box OR click the Upload button to browse to your image. Follow the steps above to add additional images. You may change the order in which images are displayed by clicking the Reorder button. Paste the URL to the location of your video. NOTE: Copying and Pasting the URL is not a requirement; if you know the address you can simply type it in. In the Location section of an event, click the icon. Enter the Location Name: The type ahead searching feature allows you to start typing the Location name, and it searches your organizations, individuals, and past event names. If you select a name from the type ahead feature, it will pre-populate the name and address field of the person/org/location you selected. If you do not select an item from the type ahead, the address fields are left blank and you are able to type in a new location name and address. Enter a Location Description: This allows you to add additional information about the location of the event (such as where to park), and will be displayed on your event page. 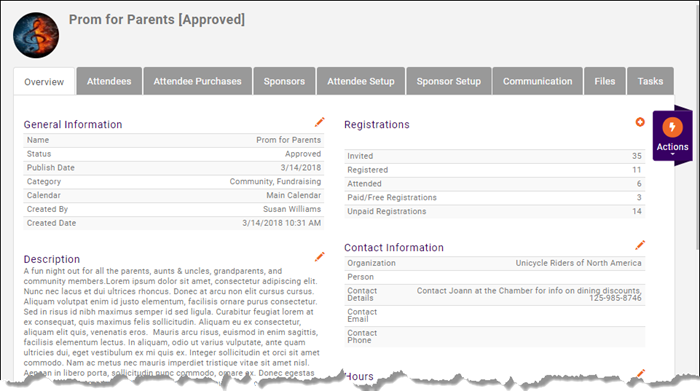 Your event registration form, fees, discounts, and so on, are setup on an Event's Attendee Setup tab. You can configure: your registration open/end dates, maximum attendees, visibility, and so on under the Overall Registration Options. On the Attendee Setup tab, click the pencil icon adjacent to Overall Registration Options. Registration Start Date - This is the date that you wish registration to start; until this date, the Register button will not be displayed on your web-site. Registration End Date - This is the date that you wish to close registration. After this date, the Register button will no longer display on your web-site, and a message indicating that registration is closed will be displayed. Max Attendees - This setting allows you to define the maximum number of people who may register for the event. Once the maximum has been reached, the Register button will no longer display on your web-site, and a message will be displayed, (unless you select Allow Waiting List in Options below. If this field is left blank, there is no limit to your attendance. External Registration Link - If you are including an event on your calendar, but registration for this is not managed through your software, enter the URL for the registration site here. Enable Registration - Click this option to enable registration (assuming the user is in the time frame indicated above). If the event does not require registration and you want it on your calendar, (a Farmer's Market, for instance), you would not check this box.NOTE: Staff members would be able to register people for the event from the back-office even if this box is not checked. Allow Waiting List - Click this option to allow a waiting list. If this option is selected, when your maximum number of attendees has been reached, registrants will be notified that they can be added to a waiting list. Show Registered Attendees Publically - Click this option if you wish to display the registered attendee list on your public web-site. Show Registered Attendees To Members - Click this option if you wish to display the registered attendees for the event in Info Hub. Collect Donations - If you are using the Fundraising module, this check box will allow you to also add a donation collection option to your registration form.NOTE: If this option is checked, an option will be added to the screen to select the Fundraiser Receipt Template. Store Invited Attendees in Attendees List: Select this option if you wish to include, on the guest list, attendees invited to your event. The number of attendees that will be stored is driven by the Event Setting Max Event Invited Attendees to Store. See Event Settings Defaults. Allow anyone to receive member pricing: This is the least restrictive option. By leaving it open, with an "on your honor" type approach, members will be able to get member pricing without having to log in and/or remember a password. That would mean that anyone would be able to use the member pricing during registration. In the event (no pun intended) that a non-member then signs up with member-only pricing, a staff member could watch for such instances and even use the opportunity to reach out to that individual with membership benefit information. This is also the option you would use if there is no different between member and non-member pricing. Email address is an exact match to an active member: With this setting, membership validation is based on email addresses. The first step in the event registration process has the user put in their name and email address. If the email address used is an exact match to an active member, it will recognize that and automatically show member pricing. Only if the member logs in: This is the most restrictive setting. If members come into an event through the INFO HUB or through a member email invitation, they will already be logged in. If a member comes to the registration page not already authenticated, they will only be able to see member pricing, by clicking "Know your member login? Login Now" and logging in. Session Changes Allowed Until - If you are using the Event Expo module and will be setting up Sessions, this check box allows you to set a time limit on when registrants can make changes to the sessions they have signed up for. By default, the registration form for an event will require name and email address (organization will be included on the form, but is not required). 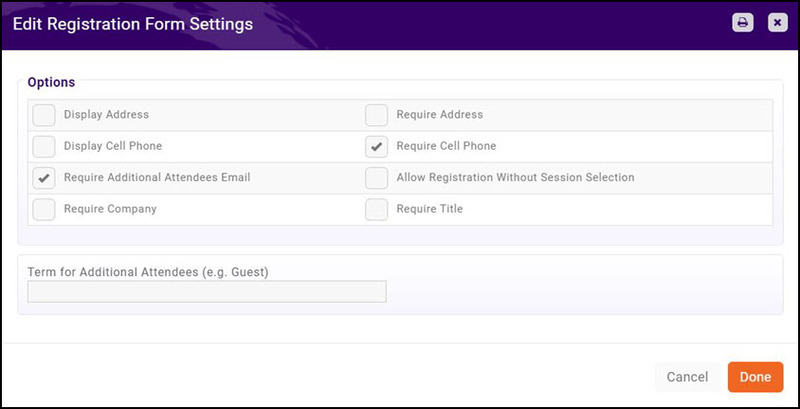 You may configure the fields you wish to require on the registration form and add custom fields in the Registration Form Settings section of the event's Attendee Setup tab. Click the icon in the Registration Form Settings section. 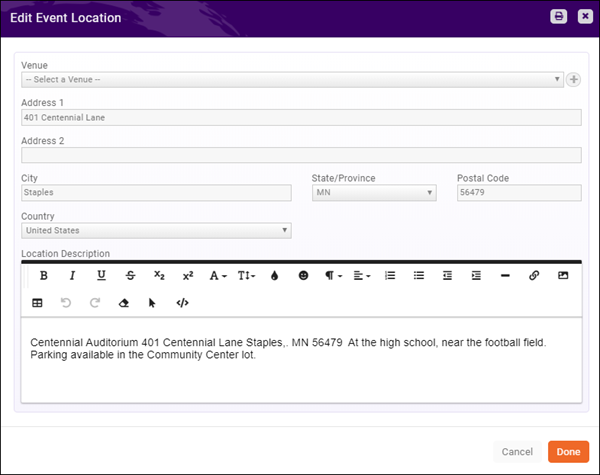 You can easily create custom fields to add to the Event Registration form. For Example, if you are offering meal choices for your annual banquet, you can gather this information from registrants via custom fields. Custom fields may also be created for your internal use, for example, tracking table numbers. Enter a Name for the custom field. This is used internally in the database. Enter a Display Name. This is the name that will be displayed on the registration form. 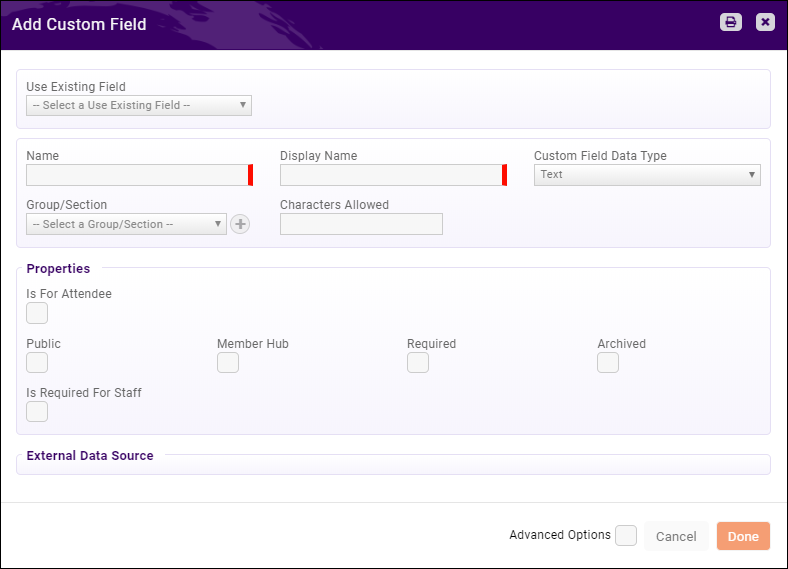 Select the Custom Field Data Type. This is the type of response that you expect for this custom field. For Example: If you want to know if the attendee has any dietary restrictions, you can select the Yes No data type. Group/Section. N/A for Event Registration custom fields. The Characters Allowed option lets you define the number of characters that may be entered when a Text data type is selected. Is for Attendees - check if this field should be displayed on the registration form. Required - check if registrants must fill out this field. Is Required for Staff - check to require staff members to complete this field when they are registering an attendee from the back-office. Click Done to save the new custom field. A pre-requisite to setting up your registration fees, is setup of the needed Goods & Services. Click Here for further information on setting up goods & services. NOTE: For proper accounting, when creating/selecting Goods & Services for your event, be sure to verify that the appropriate income, accounts receivable and deposit accounts have been selected for the goods & services. These accounts drive where the financial transactions will be reported. Additionally, registrations paid by credit card will use the default gateway set under your finance settings. If you wish to use an alternate gateway for this event, see Update Event Payment Gateway. For events, where you simply wish people to register, but are not charging a fee, you will select the Free Registration Type. On the event Attendee Setup tab, click the Actions button in the Registration Types section. Click Add Free Registration Type. Enter a Name for the Free Registration Type. Enter the Registrations Available (0 if unlimited). This option will limit the number of free registrations available, and will not allow registration with this type when the limit has been met. Enter a Description for this registration type. Registrants will be able to view the description of the fee item by clicking on the fee item link on the registration page. 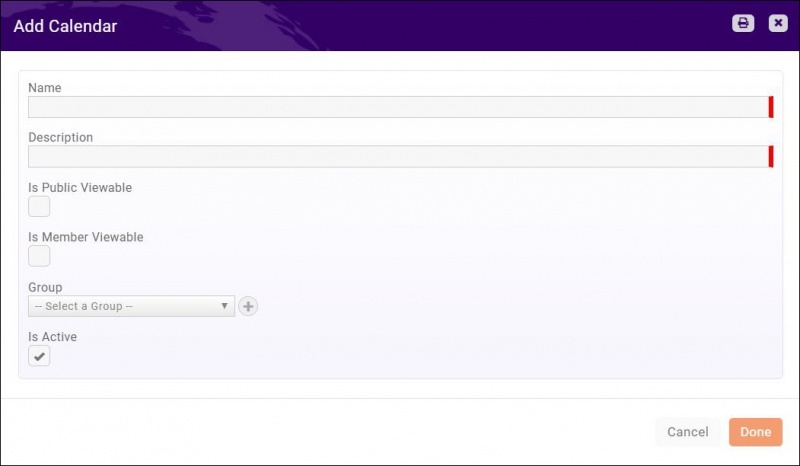 Settings options - these settings allow you to define which users can register with this type of registration. This would also display the registration types on your public page. 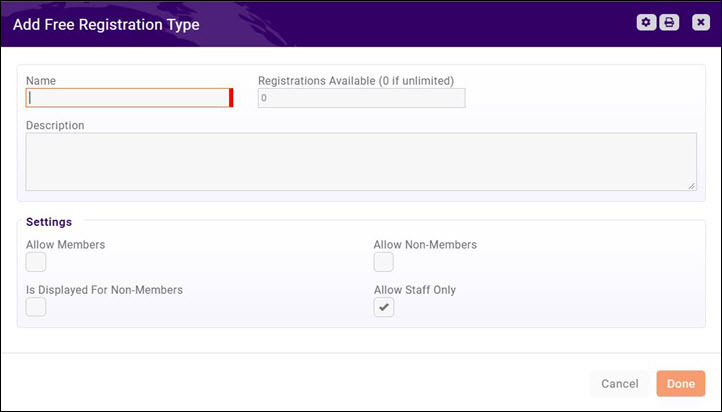 Select the Allow Members check-box if you want this registration type to be available to your members. Select the Allow Non-Members check-box if this registration type is also available to non-members. Select the Is Displayed For Non-Members check-box if you wish to display this registration type to non-members, even if you have not chosen to allow this registration type for them. Select the Allow Staff Only check-box if you do not wish to display this registration type publicly. Only your staff users would have access to this option when registering someone from the back-office. NOTE: If this option is selected, selections for members and non-members are automatically de-selected. This option will register one person per fee item. Click Add Simple Paid Registration Fee. Enter a Name for the Registration Type. Select the Goods/Service to assign to this registration fee from the drop-down list. Click here for information on configuring goods/services. The Price will automatically be populated if it was populated when the goods/service was configured. You may change the price if needed. This option should be used when the registration fee will register multiple attendees. For example, if you have a golf tournament event for which you are selling foursomes, or a dinner event where you are selling tables of eight. Click the down arrow on the Add Type button. 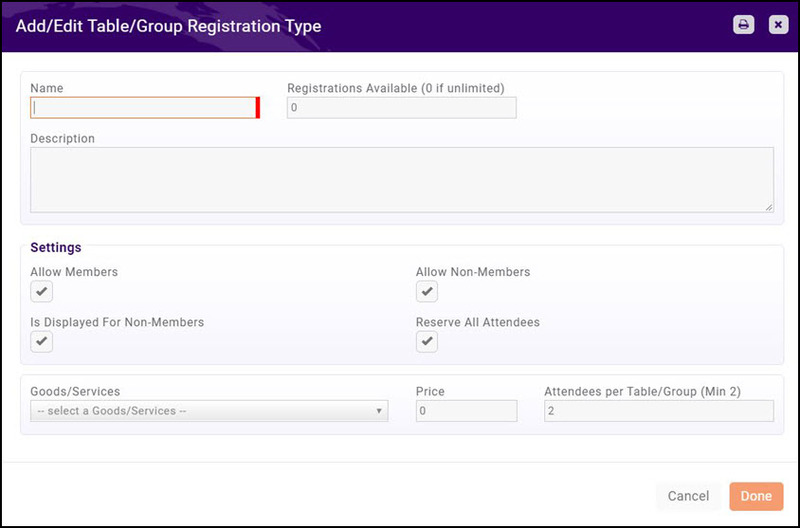 Click Add a Table/Group Registration Type. Enter the Registrations Available (0 if unlimited). This option will limit the number of free registrations available, and will not allow registration with this type when the limit has been met. If you are setting up a registration type based on tables, this would be the number of tables available. Select a fee item from the Item list. This is the previously setup registration fee for this event. Click here for further information on setting up goods/services. The Price will automatically be populated,if it was populated when the goods/service was configured. You may change the price if needed. Enter the number of attendees per registration in Attendees per Table/Group. For example, if you are selling tables of eight, you would enter 8. 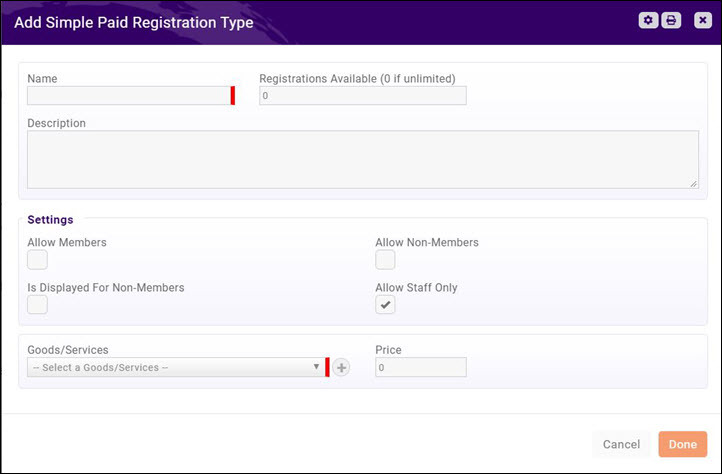 The advanced registration type allows you to bundle multiple items together for the registration fee. For example, you may wish to bundle together the event fee along with additional items. Click Add Advanced Registration Types. Enter the Registrations Available (0 if unlimited). This option will limit the number of advanced registration types available, and will not allow registration with this type when the limit has been met. Enter Attendees per Registration. This option allows you to include more than one attendee for this registration type. For example, if this advanced type is to be used for a golf foursome, you would enter 4. Click the to add the Goods/Services associated to this registration type. You will select from all previously created goods/services. Click here for information on setting up good/services. Click the to add additional goods/services to the registration type. 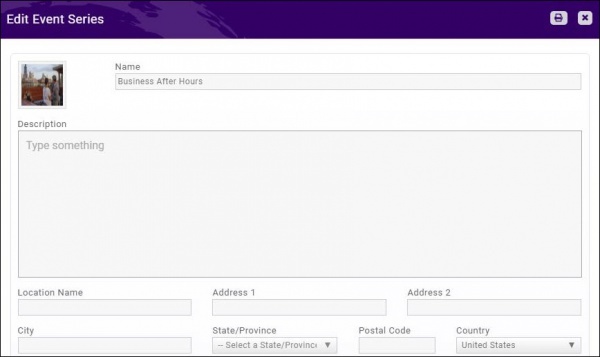 The order in which you add your registration types will be the order in which they display on your registration form. You may reorder these by hovering over the registration type, and dragging into the desired position. Once registration has begun for your event, you will be able to see, at a glance, the limits you have set for your registration types, and how many, of each registration type, have been sold. Any event may have special discounts available and applied to all or selected fees. Discounts based on early registration, promo code, or membership type, or volume may be created for each event and applied when the discount criteria is met. Discounts are setup on the Event Attendee Setup tab. There are 4 discount types"
Available Starting On - Enter the date this discount takes effect. Ends On - Enter the date this discount is no longer valid. Discount Type Previously created discount types will be included in the list. Click the + button to add a new discount type. This is important for reporting. Reduce Price by Percentage - Enter the percentage by which the standard price will be discounted. Reduce Price by Amount - Enter the dollar amount that will be subtracted from the standard price. Set Price To - Enter the price that will be used instead of the standard price. Advanced Options Applies To (Registration Type) - Selecting a registration type allows you to limit the use of this discount to that specific registration type. For example, if you have setup registration types for members and non-members, you could choose to have a discount only apply to members. NOTE: You can only select one registration type per discount. If you want a discount to apply to more than one registration type but not all of them, you will need to create a discount type for each one. 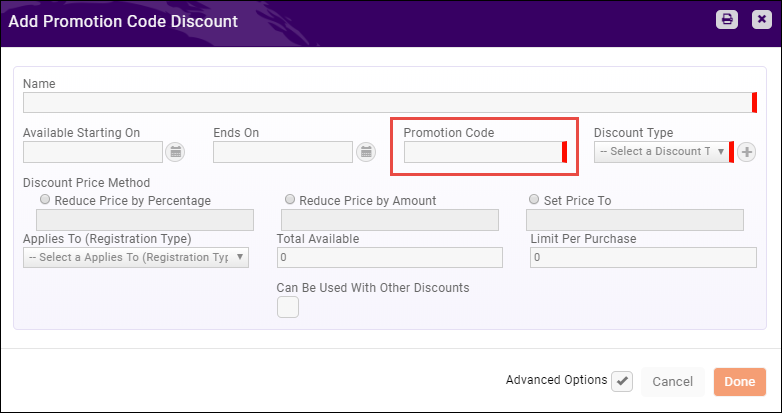 Selecting no registration type will apply the discount to all of them. Total Available - Allows you to limit the number of registrations that can use this discount. 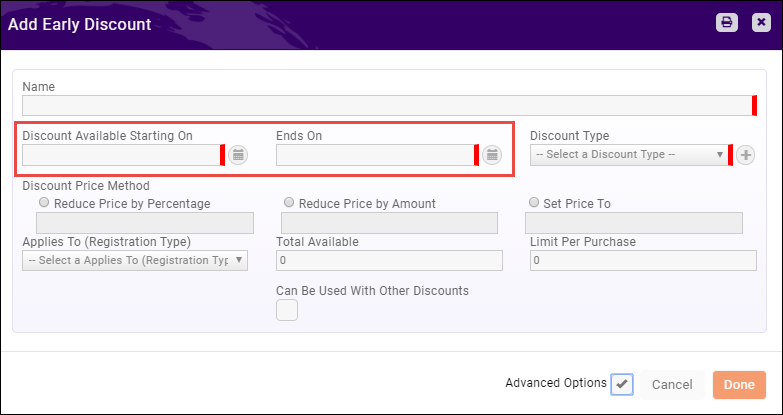 Limit Per Purchase - This allows you to limit the number registrants that can use this discount type from the same registration form. Promo Code - provides a discount if the registrant enters the code on the registration form. 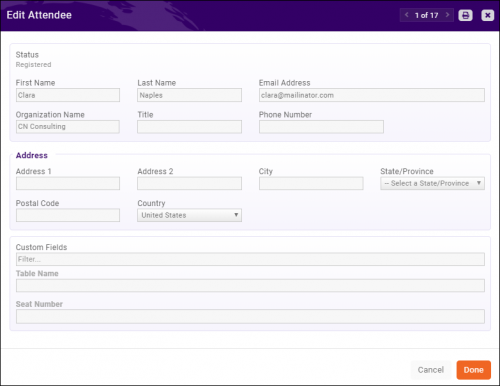 If selected, the registration form will automatically add a field for the code. Membership Type - provides a discount based on the membership type of the registrant. 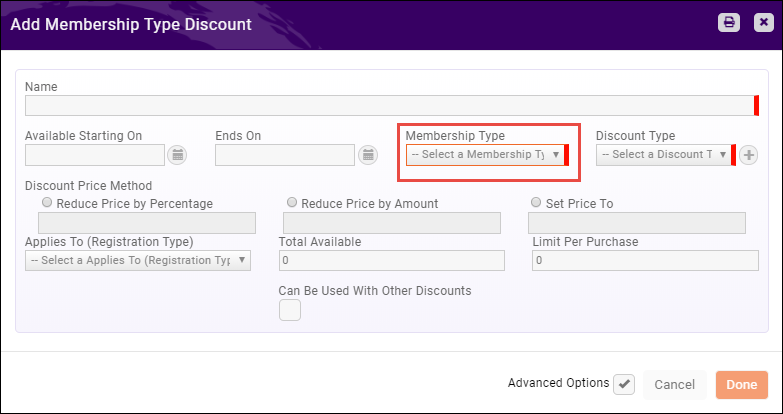 This is a multi-select field, allowing you to use the same Discount for more than one membership type. 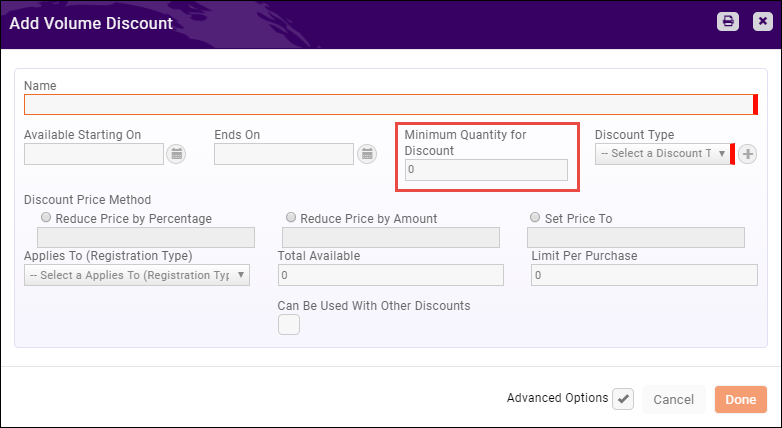 Click the drop-down arrow on the Add Discount tab to select the type of discount you wish to setup. NOTE: The Event Discount Use Report may be used to analyze how discounts have been used for an event. Click Here for instructions on running the report. 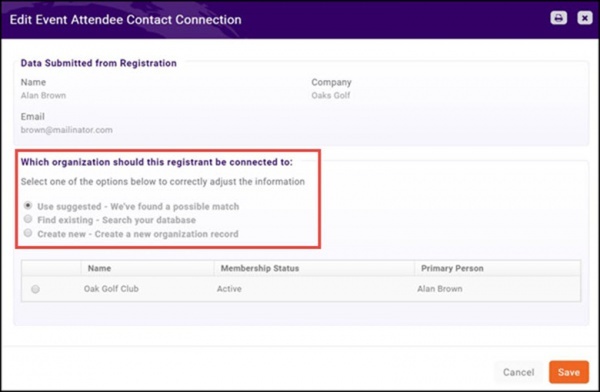 If you wish to sell additional items during the event registration process (for example you may wish to be able to sell mulligans for your golf tournament at the time of registration, or a commemorative hat), these items may be added in the Additional Items section on the event's Attendee Setup tab. Additionally, individuals who just wish to purchase an add on item, and not register for the event will be able to do so on the event registration page. Enter a Name for the additional event item. Select the desired Availability of the additional item. To allow only those who register for the event to purchase the item, select For Attendees. Select the desired Goods/Service from the drop-down list. Enter, edit, or accept the default Price. Select the Is For Members check box to allow members to purchase this item. Select the Is For Non Members check box to allow non-members to purchase this item. Select the Is Active check-box to allow the item to be displayed on the event registration form. On the Event Attendee Setup page, you can customize the instructions displayed on your registration page. You can also customize the confirmation displayed after registration is completed. The confirmation message is also added to the Confirmation Email registrants receive following their registration. Click the pencil icon to edit your messages. Note that you have robust editing features for these spaces, including adding links and images. 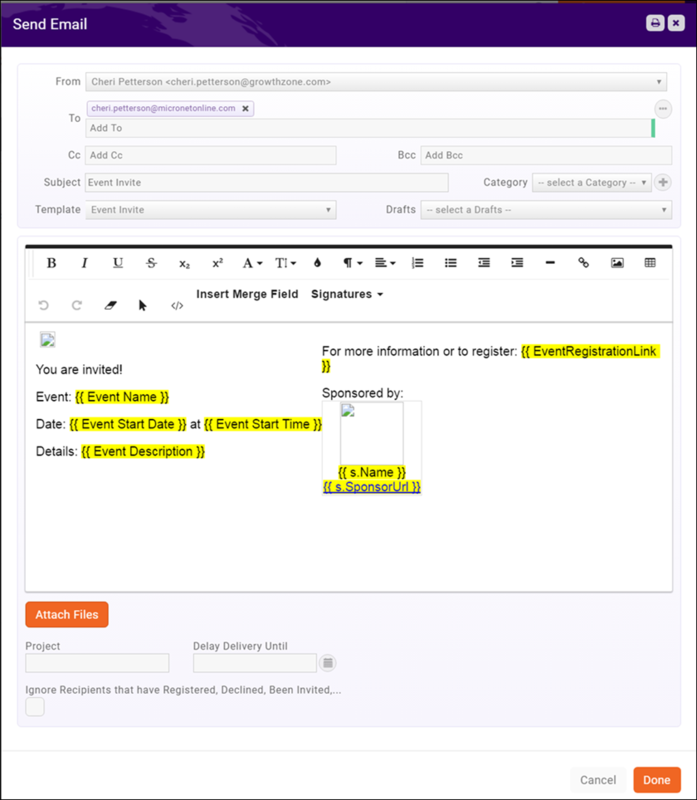 The Events Module provides a variety of ways to manage your event attendees, starting with sending invitations all the way through your post-event reports. Templates have been designed to help you easily communicate new events to your members, resend emails, send reminders, etc. Click Send Event Invite Email. This will trigger the Send Email window with the Event Invite template already selected. The use of merge fields personalizes the invite for each recipient, and provides information specific to the event that you are working with. You may edit the template to meet your specific needs. Refer to Adding Database Fields for information on adding database fields to a template. If you want to schedule the email to be sent at a future date, enter a date in the Delay Delivery Until text box. 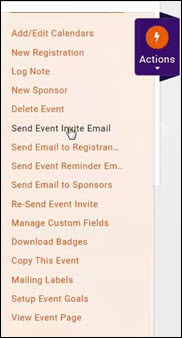 If you have previously sent an Event Invite, clicking Ignore Recipients that have Registered, Declined, Been Invited,... check-box will limit the email to those individuals who have not previously received the invite or responded in someway to a previous invitation. NOTE: You will be able to view a list of the contacts invited on the attendees tab, by selecting Invited in the Shown Only filter. 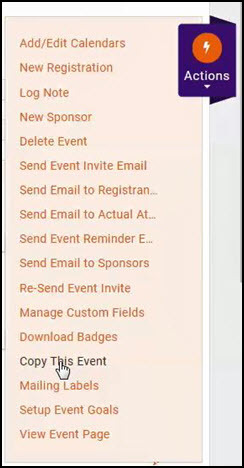 For those that are marked as "invited" in the Attendee tab of your event, staff members are able to "register" them using the gray actions button. The software will look to your previously sent email, and create a group of those that have "Not Responded Yet", as shown in the image above. The Send Email screen will automatically populate the subject line with "Event Invite", you may change this to better describe your event. The message will default to the Event Invite template, used when you sent the initial invite. Edit the template to meet your specific needs. Click Done to send the email. If you want to schedule the email to be sent at a future date, enter a date in the Delay Delivery Until text box before clicking Done. NOTE: You can also setup an event reminder to be sent automatically. See Setup an Automatic Event Reminder. A default template has not been created for Event Reminders. 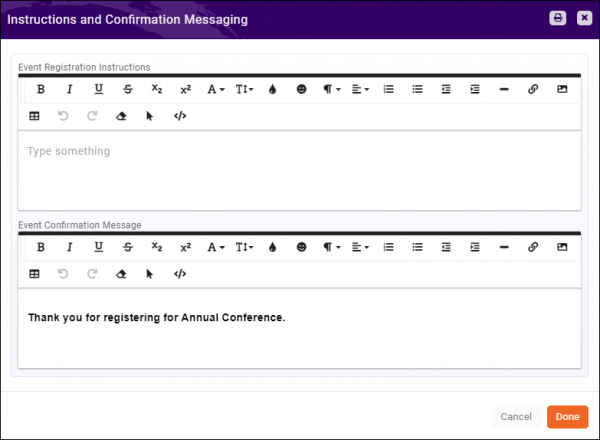 You can create the message on the Send Email screen, or, if you have a standard Event Reminder email that you send out, you may create a template. 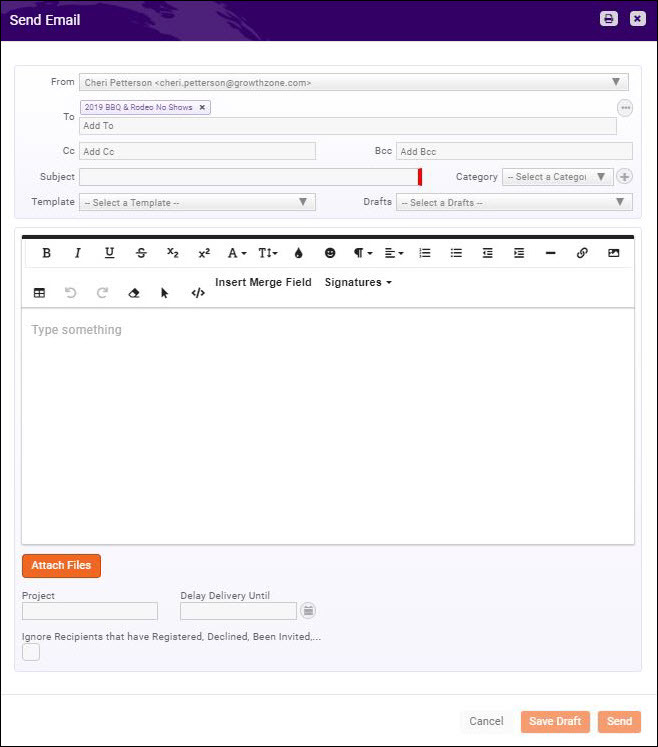 See Create and Manage Email Templates for instruction on creating email templates. Select the event Communication tab. Click Send Email to No Shows. The Send Email screen will be displayed. See Sending an Email for further instructions. All of these options work the same way as Send Event Reminder in that the system will determine who the recipients will be based on their registration status. NOTE: As with most of the tables within the software, clicking on the column header will sort the table by that column. The event Attendee tab will contain important information about the attendee, including the Registration Type and documentation of any Additional Items purchased. Each column in the table is described below. You can use the Search field, Show Only drop down, or Customize Results at the top of the table to find specific registrants or registrants that meet a certain criteria. You can add or remove columns from the displayed list, by clicking the and selecting the columns you wish to display in your list. Clicking on the Reg. Id of a registrant will give you a snap shot of the registration and an opportunity to add any comments. These comments are for internal-use only. 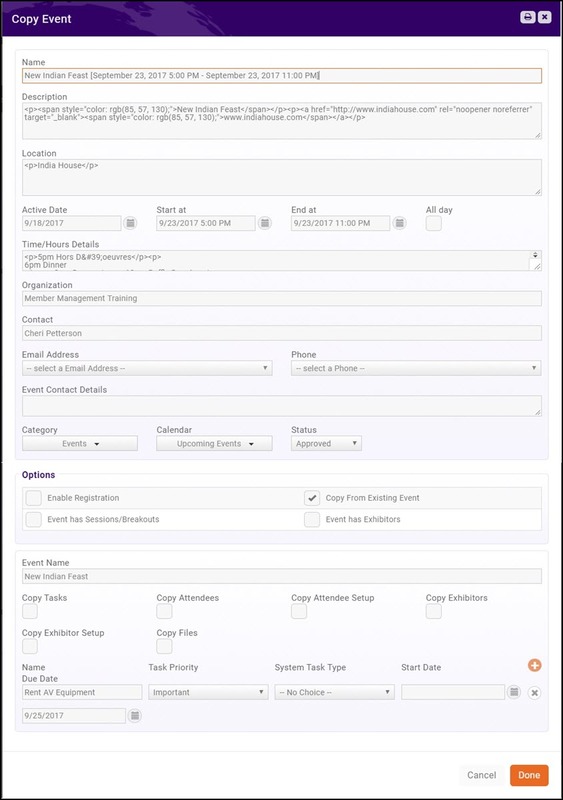 Clicking on the Name of a registrant brings up the Edit Attendee window, allowing you to edit contact information of the attendee, (which you may need for billing or other event-related communication), as well as populate any custom fields set up for the event. This function is useful when you are selling tables of 8, and need to update the Additional Attendee(s). NOTE: Any edits you make in this window will be reflected in the Contact Record. Simply a display of the registrant's organization. If the registrant is a non-member and did not enter an organization on the registration form, this will be empty. The event status column displays the registrants current status related to the event. It is a drop-down so registrants can be marked as Attended, No Show, or Unknown right from the Attendee tab. Also available on the Attendee Purchases tab, clicking on the Invoice # brings up the Edit Invoice window. This column is color-coded so you can see at a glance which invoices have been paid (green) and which are unpaid (red). If there is not an Invoice # in this column there is no invoice, indicating the registrant selected the Pay at the Door/Please Invoice Me option and they have not yet been invoiced, or it is a free event. NOTE: Any edits you make to the invoice line items here will only impact the invoice, not the actual event. In other words, if you add a line item for an event registration, you are only adding those dollars to the invoice, you are not actually registering them for the event. Simply a display of the registration type. Sorting by this column will put all like-registration types together. If there are additional items available for purchase during event registration and a registrant purchases 1 or more, the number purchased will appear in this column. Clicking on the number will display the quantity of each item purchased by that registrant, organized by Attendee Items and Registration Items Refer to Additional Items for information on the difference between these types. From the Actions drop-down on the far-right side you can cancel the registration, edit the attendee (same as clicking on the Name), and print a name badge for this attendee. (You can print bulk badges from the orange Actions button at the top of the screen). If the invoice has not yet been paid, you can also enter a check or credit card payment. For the desired event, click the Attendees tab. Click the orange Actions button. Complete the event registration form and payment information as needed. Send Event Confirmation Email to Registrant: This option is enabled by default. Deselect the check-box if you do not wish to send a confirmation to the registrant. The system will record, for future reference, that the confirmation was not sent. For the desired attendee, click the Actions button in the Actions column. Click the Update Registration button. Make the desired updates to the registration. NOTE: If you add additional attendees, and you select the Invoice option, the fees will be added to an existing invoice, if applicable. Between the Additional Items and the Actions columns there is an unnamed column that may contain an icon for some registrants. If there is NOT an icon, it means the system recognizes both the Individual and the Organization as existing contacts. If there IS an icon, it means something about the registration doesn't match the data in the system. Clicking on the icon allows you to view the information and make a decision about the registrant. Update Organization This icon will appear if the Organization the registrant entered on the registration form is different than what the system has for this person. Use suggested - We've found a possible match - If the software is able to find a suggested match, a table of matches from the database it will be displayed. Click the radio button for the desired organization to associate the registrant to that organization. NOTE: If there are no "suggestions" then this option will not be displayed. Find existing - Search your database - if a suggested match is not displayed, or is not accurate, select this radio button to search for the desired organization. A type ahead text box will be displayed. Begin typing the name of the organization you wish to locate. Create new - Create a new organization record - If the registrant's business is brand new to your database, click this option. A new business will be added using the Company name provided by the registrant. Do not update contact - this option will leave Bob Smith as the registrant within the event, (Bob Smith will be printed on the name tag and check-in roster), but the registration action and invoice will still go to Robert Smith since the email is a direct match. Match to Contact: This icon will appear when the system does not recognize the name, email, or organization of the registrant. NOTE: If the registrant did not enter anything for their Organization when they registered, this section will not appear in the edit window. Find existing - Search your database - if a suggested match is not displayed, or is not accurate, select this radio button to search for the desired individual or organization. A type ahead text box will be displayed. Begin typing the name of the contact you wish to locate and select it when it appears in the list. 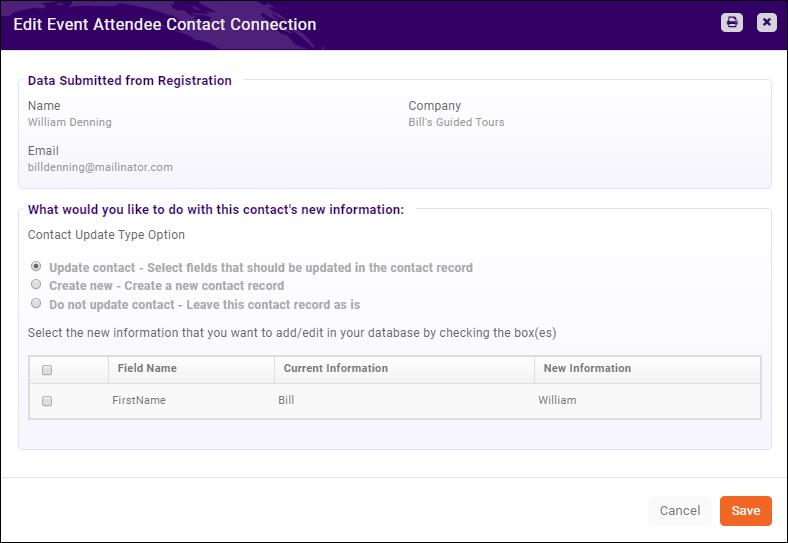 Create new - Create a new contact record - If the registrant is brand new to your database, click this option. A new individual contact will be added to your database as a non-member. You can cancel a registration from the Attendees tab. Click on Cancel Registration at the top of the drop-down. Below are several scenarios to consider once you have cancelled a registration. NOTE: These are only applicable if an invoice and/or a payment have been received for the registration. An invoice has been created for the registration, but not paid: In this scenario, best practice is to void the invoice. See Void an Invoice for instructions. If you have a no refund/no credit policy, you need do nothing else. If you have a refund policy, create a refund as described in Refund a Payment. You may create the refund on the Attendee Purchases tab. If you have a no refund policy, but are willing to issue a credit, create a credit as described in Add a Credit Memo. You can update names of attendees as well as additional attendee information (for example: custom fields) on the Attendee tab. In the desired event, click the Attendee tab. Click the name of the attendee for which you would like to update information. You can easily download badges for your event, and a variety of Avery Style templates are available. Click on the orange Actions button in the top right corner. Sort Order This is the order in which the badges will be printed. The PDF or Word document will download. Open and Print. If you have enabled Allow Waiting List, on the Attendee tab, you will be able to view who is on the waiting list, register people on the waiting list, and remove people from the waiting list. If the waiting list is enabled, once you have reached the maximum allowed for the event, registrants will see "Maximum attendee limit for the event has been reached. 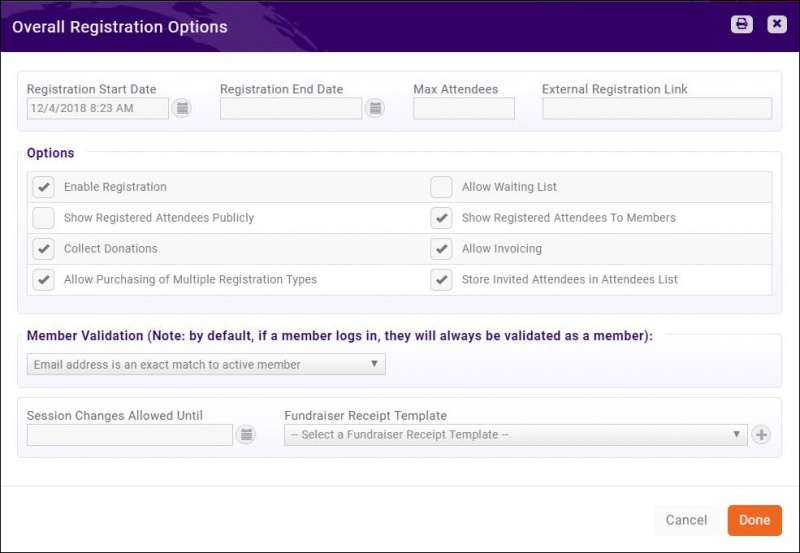 You have to add X attendee(s) to the waiting list, or remove them to continue" when trying to register. If the registrant chooses to continue, they must select the "Add to Waiting List" check-box. 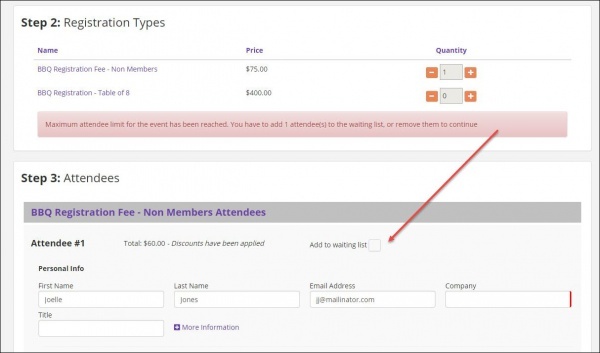 You can view registrants on your attendee tab by filtering to Waiting List in the Show Only drop-down. Should registrations open up, you may register from the Attendee tab, or remove them from the waiting list. Click Actions in the Actions column for the person you wish to remove from the waiting list. Click Remove From Waiting List. This is an immediate action, there is no "undo". While there is no established Check-in Roster document, you can achieve the same result by selecting Download Attendees from the orange Actions button in the top right corner of the Attendees tab. This will download an Excel file while you can edit to suit your needs and print to take to the event. Click the orange action button. Select the desired Attendee status from the drop-down list. An Excel file will be available for you to use as a check-in roster. Click on the Event Status drop down of the registrant you are working with. Click on the appropriate status (Attended, No Show, Unknown). For each attendee, select the appropriate attendance status: Attended, No Show, Unknown. You can download a list of all of your event registrants to have a complete lists of all registration information. For example, if a meal choice was a custom field, you can use the download function to a create a list for the caterer. On the event's click the Attendee tab. Select the desired Attendee Status. The Attendee Purchases tab will contain important information about the event-related purchases made by the attendee, including the Invoice # and and Discounts. Each column in the table is described below. Also available on the Attendee tab, clicking on the invoice # brings up the Edit Invoice window. This column is color-coded so you can see at a glance which invoices have been paid (green) and which are unpaid (red). If there is not an invoice # in this column there is no invoice, indicating the registrant selected the Pay at the Door/Please Invoice Me option and they have not yet been invoiced, or it is a free event. NOTE: If an invoice has been written off, the invoice number is marked with a strikethrough This helps staff members see at a glance that those invoices have been manipulated. In the Edit Invoice window you can make various edits to the invoice itself. If a payment has been made you can also view the payment history by clicking on the Reference Number in the Payment History section or Download Payment, Send Email, or Create Refund, all available from the Actions button in the Actions column in the Payment History. If no payment has been made, the Payment History section will be empty. For viewing only (not clickable), this displays the total of the invoice for the event registration, including actual registrations and additional items. 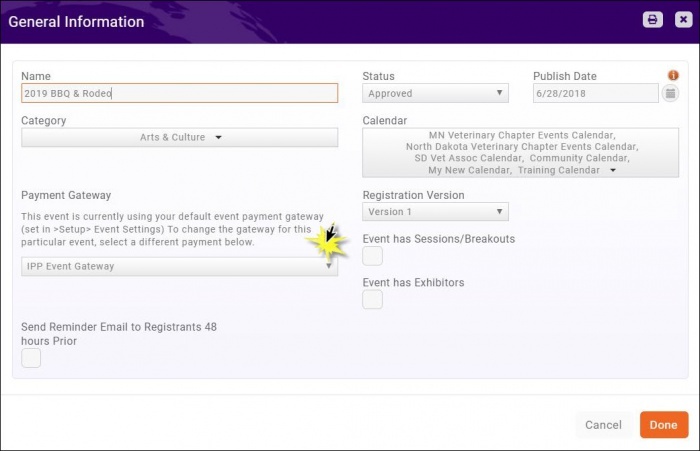 On the Attendee Purchases Tab., click the Actions drop-down of the registration for which you are entering payment. Select the payment type you are enter, Check or Credit Card. Refer to Billing: Accept Payments for the final steps. 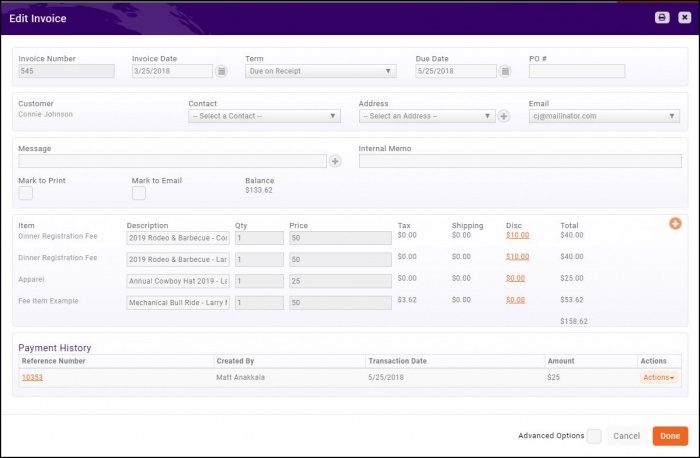 The Send Email screen will be displayed, with the Billing Name in the To: field and the invoice automatically attached. NOTE: Members with Create or Full Control access to Events in the Info Hub may add events, but the events must be approved by staff. If you wish to auto-approve events, enable Auto Approve Events Submitted From Hub under Setup > Info Hub Settings. When an event is submitted via the Info Hub, staff who have subscribed to the Event Submitted For Approval will receive a notification that an event has been submitted. See Configure User Notifications for details. Click the Approve Event link in the email. If you are currently authenticated in the software (logged in), you will be taken to the event's Overview tab. If you are not currently authenticated in the software (not logged in), you will need to log-in and navigate to the event's Overview tab. Click the in the General Information section. Select Approved or Declined from the Status list. Using the Sponsors/Ads module in conjunction with your events allows you to generate additional revenue and have GrowthZone do a lot of the work for you—-win win! To get started, you will setup Sponsorship Benefits. Once created, you will be able to use the benefits through all of your events. NOTE: The Sponsors/Ads module is required to use this functionality. Benefits consist of any combination of the Sponsor Name, Logo, and/or URL appearing on the Event Page, Emails, and/or Registration page. For example, perhaps a Bronze sponsor has only their Name on the Event Page, the Event Emails, and the Registration Page; the Silver sponsor has their Name AND Logo on all three, and the Gold sponsor gets their Name, Logo, AND url on all three. You can create any combination; the only caveat is that if you want to display the url you must also display the name and logo. ClickSetup in the left navigation panel. Click Event Sponsorship Benefits in the Events section. Any existing benefits will be displayed. Enter a Name for the the new sponsor benefit. Determine the Display Order of this Benefit. For example: Assuming Gold sponsors are displayed before Silver, and Silver before Bronze, Gold would have a Display Order of 1, Silver would be 2 and Bronze would be 3. Sales Goal Quantity-Optional and internal. If you have a goal of X number of sponsorships of this type, enter that number here and the system will help keep track for you. Maximum Quantity-Optional and internal. If you are limiting the number of this sponsorship type for this event, enter that number here. Hide on Invoice Check this box if the sponsorship is part of a bundle and you do not want it to appear as a separate line item on the invoice. The amount will roll into another invoice item and still be included in the total. Select the Sponsor Benefits this sponsorship type is related too. NOTE: It may be helpful to name your Sponsor Benefits the same as your Sponsor Types, to help match up at this stage. Currently sponsors can only be registered through the back office by a staff member. Go to the Sponsors tab of the Event. Any sponsors already registered will appear here. Sponsor Name The name of the sponsor--this contact must already be in your database. Qty This will default to the quantity you entered when you created the Sponsorship Type. It can be edited. Price and Total are populated automatically based on the Qty and the Price you entered when you created the Sponsorship Type. They cannot be overridden. Internal Memo This is a note to yourself or your staff regarding this sponsor. It is not required and is not public. Sponsor Url The URL of the contact (if populated in the contact record), will automatically populate this field. It can be removed or edited. If it is edited it does not impact the contact record. Sponsor Logo The logo of the contact (if populated in the contact record), will automatically populate this field. It can be removed or edited. If it is edited it does not impact the contact record. If you consistently offer the same booth types for your exhibitors, you can configure these ahead. This allows you to define booth configuration types, sizing and style of booth, as well as define your booth numbers. NOTE: The booth configurations, once setup, will be available any time you are setting up exhibitors. The booth types will then be available for selection when setting up your event registration page. Alternately, you can create the booth types on the fly setting up the event. Click Booth Configurations in the Events section. A list of booth configurations you have previously setup for your organization will be displayed. Click the Add button to add a new configuration. Enter a Name for the booth type. The name will be included on the exhibitor registration form. A name may be something indicating the size and other characteristics of the booth. Enter a Description of the booth type. This can also be included on your exhibitor registration form. Select a Venue for the booth type. This indicates the location of the booth. If you have previously created venues, you may select one from the drop-down OR click the + button to add a new venue. Booth Styles/Inventory: click the orange plus icon to add new booth styles and the number of each available. Enter the Starting Number. This is the first booth number of this configuration type. Enter the Ending Number. This is the last booth number of this configuration type. Enter the Width and Height of this configuration type. Enter the Style of this configuration type. Minimum Quantity per Exhibitor - Enter the minimum number of this configuration type that an exhibitor may register for. Maximum Quantity per Exhibitor - Enter the maximum number of this configuration type that an exhibitor may register for. Repeat steps above to add additional configurations. Once all configurations have been added, click Done. NOTE: The Exhibitors options will only be displayed if you have selected "Event has Exhibitors" when the event is first setup. On the Event page, click the Exhibitor Setup tab. NOTE: The Exhibitors Setup tab will only be displayed if you have selected "Event has Exhibitors" when the event is first setup. Configure your Exhibitor Registration Optionsby clicking the pencil icon for Exhibitor Registration Options. Enter a Registration Start Date - This is the date you wish to open registration for your exhibitors. Enter a Registration End Date - This is the date that registration will close for exhibitors. Select an Exhibitor Directory to be used for the exhibitors. You can add a new directory by clicking the + button. Select your Terms/Conditions - These are terms/conditions that an exhibitor must agree to. Enable Registration - Click the check-box to enable on-line registration. 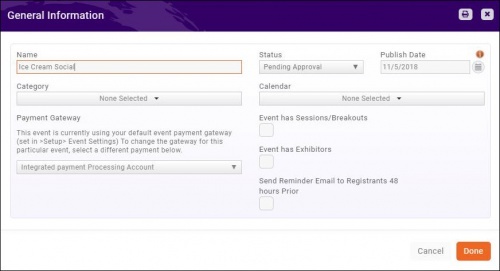 Allow Invoicing - Select this option to allow the exhibitor to request to be invoiced. 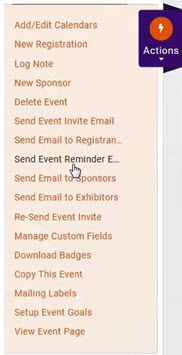 Allow Logo - Select this option to allow the exhibitor to upload a logo when registering for the event. 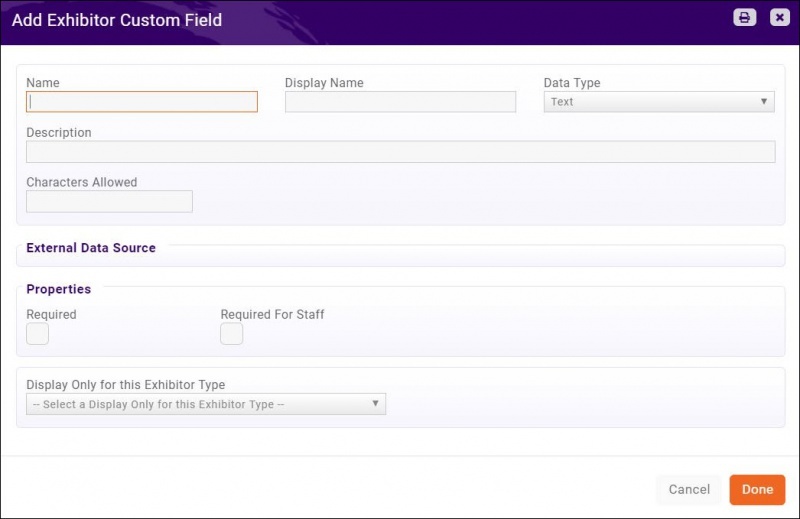 Configure Exhibitor Types: This function allows you to setup your exhibitor packages. Click the + icon to add a new Exhibitor Type. Enter a Name for the Exhibitor Type - this name will be displayed on your web-page. 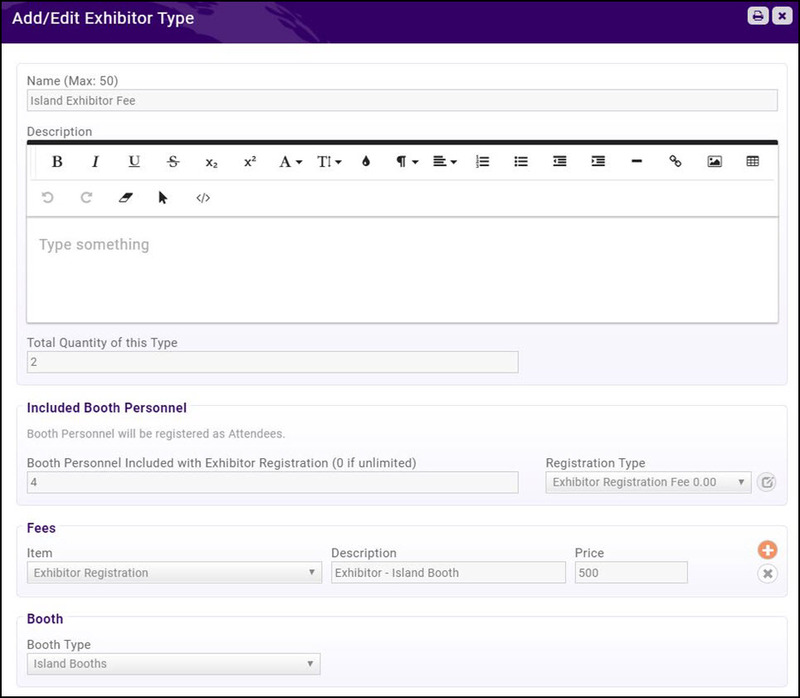 Enter a Description of the Exhibitor Type - the description will be displayed on your web-page. Enter the Total Quantity of this Type - this is the total number of this type of booth. The software will track the number available/sold, and close sale of this type when total quantity is reached. Included Staff Personnel: This section allows you to define the number of attendees allowed with the exhibitor registration, as well as the number of extra personnel that can be included. The Staff Registration Type is the cost of additional personnel. Select a Staff Registration Type from the drop-down list. 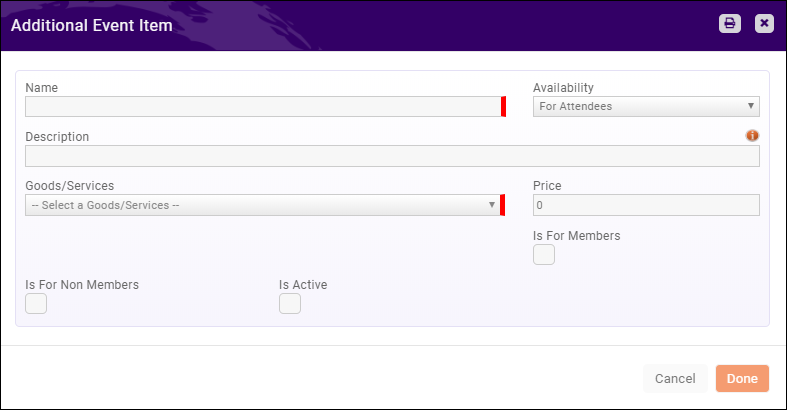 This allows you to assign the fee item, and the price to be added to the base price of the exhibitor registration. 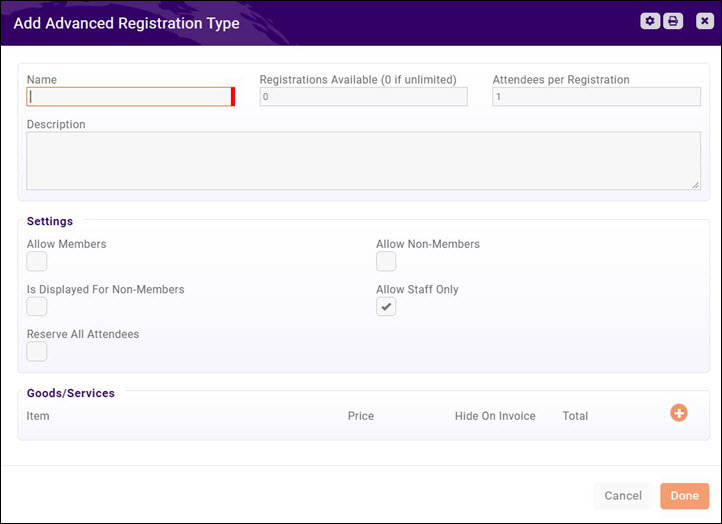 NOTE: Registration fees may be added on the Attendee Setup tab for exhibitor type configuration, or you may click the to add a new registration type. Refer to Setup Your Event Fees for further instruction on setting up fees. Enter Staff Personnel Included with Exhibitor Registration (0 if unlimited): This setting allows you to limit the number of personnel the exhibitor can include as attendees. If set to 0 there is no limitation. If you wish, you will be able to offer the option to charge for additional attendees. Extra Allowed with Purchase: This setting allows you to limit the extra staff that may be added to an exhibitor registration. Base Fees: This section allows you to define the base fee for the exhibitor registration. Click the icon to add fees. Select a previously configured fee item from the Item drop-down list. Edit and/or Enter the Price of the fee item. Select a Booth Type from the drop-down list. Click the icon to add a new booth type. See Exhibitors - Initial Setup for information on configuring your booths. 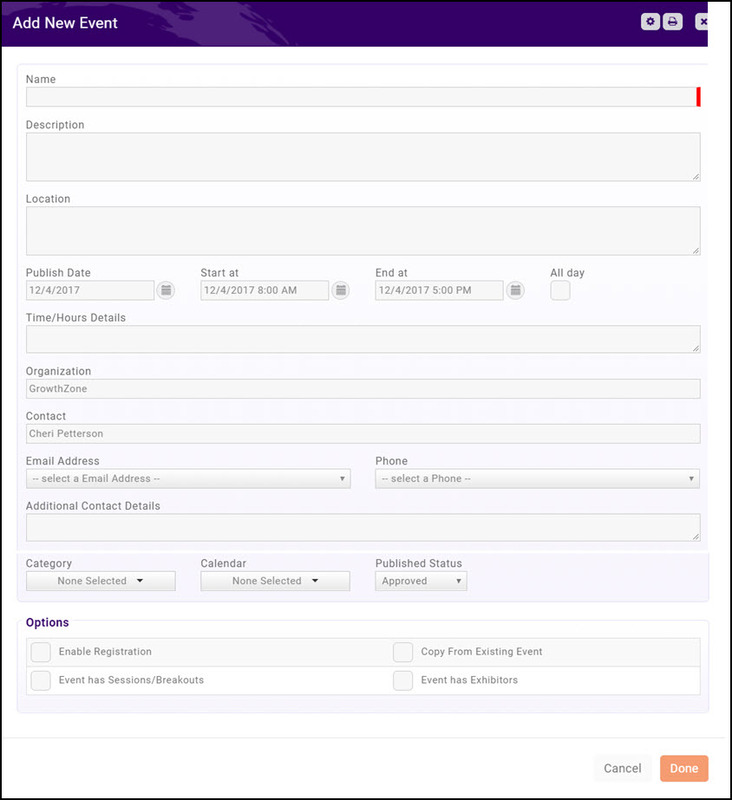 Setup Exhibitor Custom Questions: This option allows you to add custom fields to the exhibitor registration page. Enter a Name for the field. This is the name that will be displayed in the back-office. Enter a Display Name for the field. This is the name that will be displayed on the exhibitor registration form. Select the Data Type. See Custom Fields for further information on data types. Enter a Description: This will be displayed on the Exhibitor registration page, and provides a way to clarify the question you are asking. Enter Characters Allowed: This option is only displayed if Text or Multi-text is selected, and allows you to limit the number of characters entered. This field MUST be populated. If the registrant must fill in this field, click the Required check-box. If your staff must fill in this field, when registering someone from the back office, click the Required For Staff check-box. If the custom field should only be displayed for certain registration types, select the registration types from the Display Only for this Exhibitor Type list. 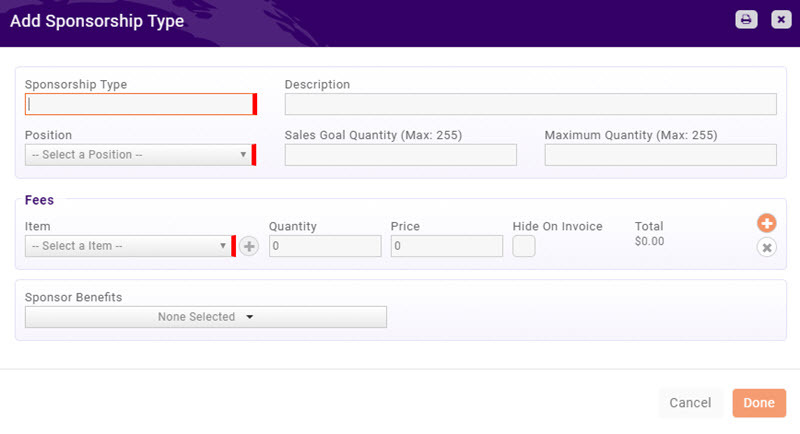 If there is a fee associated to this custom field, select a previously created fee item from the Saleable Item drop-down or click the to add a new saleable item. The Exhibitors (Beta) will display a list of registered exhibitors. If using the Expo Module, you can setup and manage sessions for an event. The first step in setting up sessions for an event is to define timeslots. Once timeslots have been created you will setup your sessions, and assign sessions to the timeslots. On the desired event, click the Sessions/Breakouts tab. Click the 25px icon to add your timeslots. Enter the Start Time of the session. Click the calendar icon if needed. Enter the End Time of the session. Click the Calendar icon if needed. Repeat steps 2 - 6 to add additional timeslots. Once timeslots have been created, you will create your sessions and assign to timeslots. 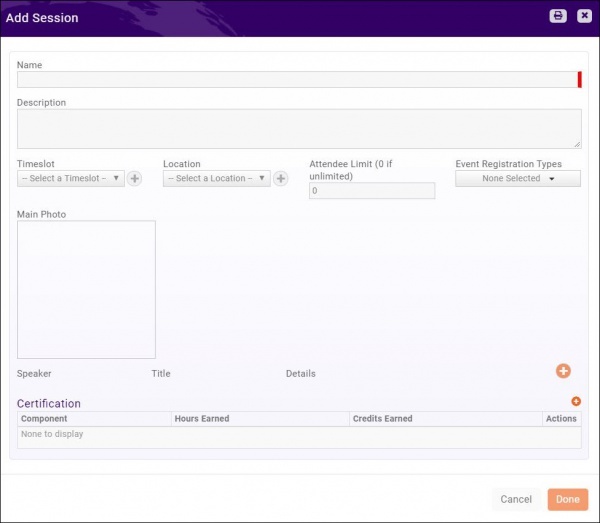 See Add Session Timeslots for instructions on setting up your timelots. NOTE: In addition to having setup your timeslots, you must also have registration fees setup. When creating a session, you will select the registration fee that a registrant must select in order to be eligible for the session. See Setup Your Event Fees. 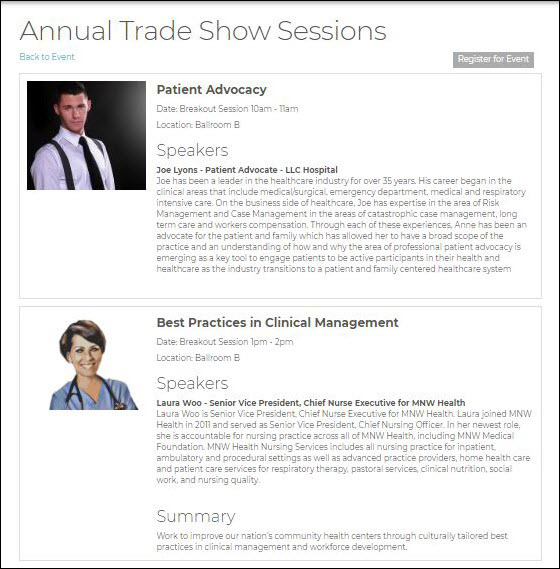 For the desired event, click the Sessions/Breakouts tab. Name: Enter a name for the session. Description: Enter a description for the session. Timeslot: Select the desired timeslot. See Add Session Timeslots for instructions on setting up your timelots. Location: Select the location of the session from the drop-down list. If needed, click the 25px icon to add a new location. Attendee Limit (0 if unlimited): Enter the maximum number of attendees allowed for this session. Set to zero if there is no limit. Event Registration Type: Select the event registration type eligible for attendance in this session. Main Photo: Upload a photo for this session. For example, you may wish to upload a photo of the speaker. Click the 25px icon to enter the name, title and details of the Speaker. (Optional) If using the Certification module, click the 25px to add a certification for this session. When you event is setup with Sessions an Event Sessions button is displayed on your event page. Clicking the Event Sessions button, will open up a page which displays a list of all available sessions. Registrants may click the Register for Event button, to select a registration type, and the sessions that they wish to attend. For the attendee, click Actions. When a registrant selects sessions for an event, the confirmation received will include a list of the sessions they have selected. If needed, you can resend the confirmation. NOTE: This option is only available when an event has sessions. An email is sent to the registrant. For the desired session, click the numbered link in the Registeredcolumn. You may print this list by clicking the printer icon. You can also use the Event Sessions Report to view a list of all registered attendees. In the Status column, you may choose Attended, Unknown or No Show from the drop-down list. Various reports are available for you to analyze your events. Allows you to generate a list of event attendees, filtered by a specific date range, event category, calendar, list, event, attendee registration status, and/or customized search criteria. 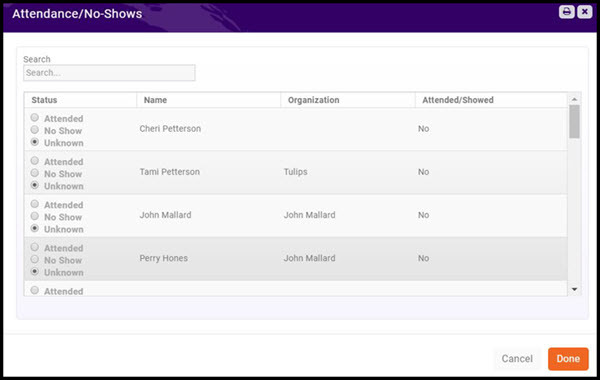 Example usage of this report includes analyzing attendance in specific event categories, or to view a list of all contacts who have been invited to events in a specified date range, but have not attended. Select Display Options. The system is setup with default fields to display in your report. You may add or remove fields by clicking on the Fields to Display drop-down arrow. Select Summarize by criteria. This optional field allows you to select how you wish report results grouped. For example, you may choose to group results by Event Name. Allows you to generate a list of a contact's event-related activity The report may be filtered to view the event activity for an individual contact or all contacts, within or for a specified date range, a specific event, registration status, and/or customized filtering criteria. Select your search filtering criteria. NOTE: To exclude event attendees that are not contacts, click the Display Only Contacts check-box. Optional - Enter Search/Filter query. Provides you with statistics on how discounts are being used. You can generate the report for a specific registration date range, one or more events, and/or by adding additional filtering criteria (including a particular discount. Select Event Discount Use Report. Select your search filtering criteria. For example, if you wish to view discount use for a specific event, select an option from the Event drop down-list. Optional - Enter a Search/Filter query. 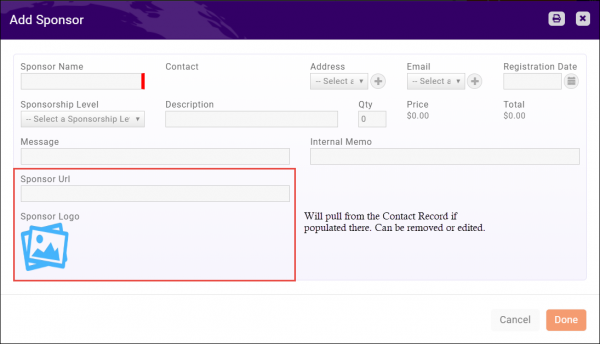 For example, if you wish to view the report based on a specific discount select Discount Name. The Event Sessions Report can be used to generate a report of all session registrants. You can run the report for an individual session and use the report as a check-in roster, or run the report for all the sessions offered at your event. Event Name: Select the desired event. If no selection is made all events will be included in report results. Event Session: Select the desired session. If no selection is made, all sessions will be included in report results. Event Timeslot: Select the desired timeslot. If no selection is made, all timeslots will be included in report results. 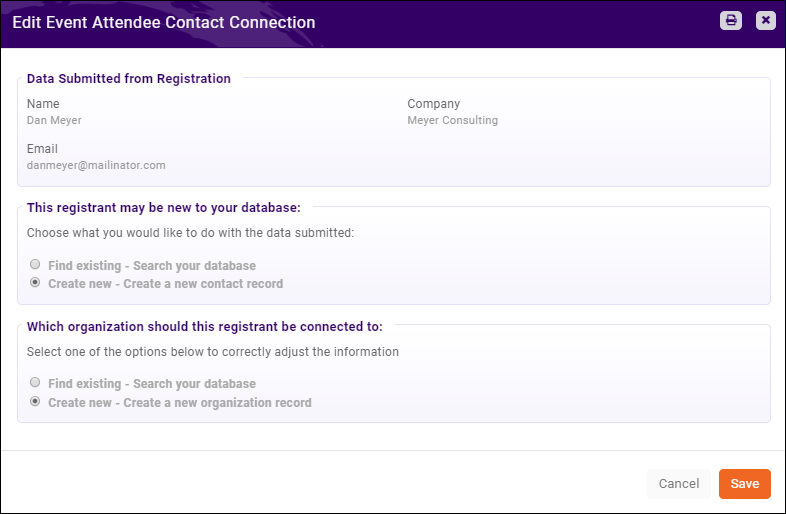 Display Only Contacts: Select this option if you wish to see only registrants that exist as contacts in your database. Contact: If you wish to see only an individual contact, enter the name of the contact. Additional Criteria / Filters: You may add additional filters by click the 25px. Fields to Display: Default fields are included in the report. You can add or remove fields as needed. Summarize By: If needed, select a summarize by option. This will group the report results by the field selected. For example, if you are running a report for all of an event's sessions, you may wish to summarize by the Session Name. Summarize By: Select Detail to view details of attendees or select Summary to view a total of attendees (without attendee names). How can I change the way fees are displayed on invoices? Click here. How can I setup my fees so that I can defer revenue revenue recognition to the date the event starts? Click Goods/Services in the Services, Products and Commerce section. Revenue Recognition Type: This setting allows you to configure when the revenue will be recognized. Select Fully on Event Start Date to defer revenue recognition until the start date of the event. Deferred Income Account: Select the deferred income account for this good/service. The drop-down list will be populated with the deferred income accounts configured in you Chart of Accounts. If you have chosen to defer the revenue for this event to a specific point in time, the revenue will be held in the deferred income account until that point in time. With this goods/service, as registration fees are processed, the revenue will be placed in the deferred income account selected for the goods/service. On the day of the event, the revenue will be moved to the income account you selected for the goods/service. Income in the deferred revenue account can be monitored by running the Accounting Transaction Report or the Sales by Account Report. Click Here to view reports. This page was last modified on 12 April 2019, at 11:39.